Q: Which Tigers outfielder has produced the most value at the plate during the last two seasons? That was easy. What might not seem as obvious is the player who trails Ordonez by just 4.5 batting runs, and 0.2 WAR, during that span. That’s Ryan Raburn. In fact, during the last two seasons no Detroit outfielder has come close to his production at the plate. In 2011, with the team’s outfield lacking depth, Raburn should finally get his shot as a full-time starter. Given his career performance, he doesn’t figure to disappoint. Raburn hits the ball to all fields with authority and has elicited comparisons to Jeff Kent as an offensive-minded second baseman since he shifted from the hot corner. He was a poor defensive third baseman, but his hands are good and he has an average arm. It took Raburn two more full seasons in the minors before he cracked 100 PA in the majors, and he didn’t play in more than 100 games until 2009. Along the way he has, with one exception, done nothing but hit. His only real disappointment came in 2008, when he produced a .295 wOBA in 199 PA. During the last two seasons he has come on strong, producing a .364 wOBA in 701 PA. Through his age-29 season, Kent produced a .338 wOBA in 2981 PA. Raburn has barely a third of those PA, but he has produced a .346 wOBA in that span. He also out-produced Kent in his age-28 and age-29 seasons. The upshot is that Kent did his best work after the age of 30. Raburn will have to have a similarly uncommon career path in order to fulfill this early comparison. Even though he’s not a second baseman, Raburn can still provide value with the bat. He certainly figures to rank among the better corner outfielders in the league. Last year his .354 wOBA ranked 25th among outfielders with 400 or more PA. Even if he drops off a little bit while playing a full season, he still figures to rank among the top 30 outfielders in 2011. 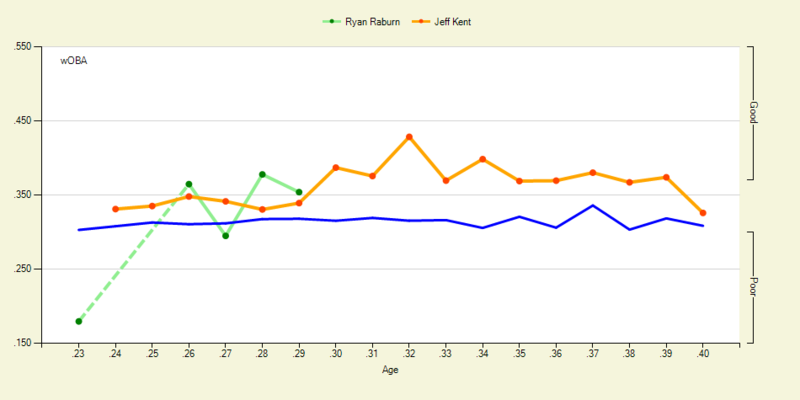 To this point, Raburn hasn’t really gotten a shot. He topped out at 113 games in each of the last two seasons, even though he probably deserved more playing time in both. This year, though, he’s set to start. It could be the year we see him break out in a major way. He probably won’t out-produce his 2009 and 2010 numbers, but he’ll provide plenty more value by playing in 40 more games and coming to the plate 200 more times. We hoped you liked reading Raburn Getting His Chance in Detroit by Joe Pawlikowski! Wainwright’s Injury: Key to Signing Pujols? Shhhh….don’t give away my sleeper! Given his 2b eligibility in Yahoo leagues, it’s amazing he hasn’t gotten more attention.